Mac OS X can automatically open iPhoto, Aperture, or another program whenever you connect your digital camera or media card, but not everyone likes this behavior. In fact, one of the common questions we receive from readers is how to disable it. (Hint: you don’t turn it off in iPhoto, Aperture, or even System Preferences; the setting is hidden in the preferences dialog for the Image Capture application.) But if your beef with this automated device-handling is not that it exists at all, but rather that you’d prefer it if OS X could handle each device differently, Flexibits’s Cameras is for you. 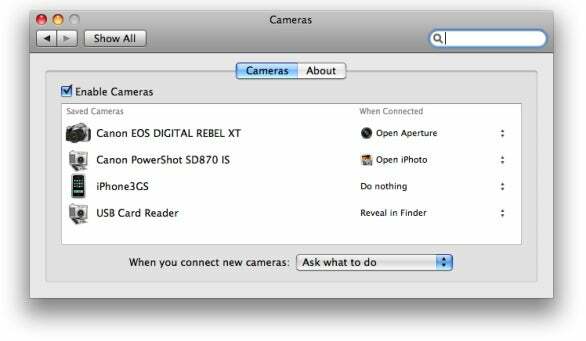 Once Cameras is installed, connecting a photo-related device—a digital camera, an iPhone, a memory-card reader—causes a dialog to appear, asking you to choose an action: Do Nothing, Open iPhoto, Open Image Capture, Open Other Application, and so on. These options are similar to those you’ll find in the stock OS X dialog, but there are also two new choices. The first, available only when you insert a memory card into your memory-card reader, is Reveal In Finder, which opens a new Finder window displaying the contents of your media card. The second new option is Automatically Download, which, as its name implies, automatically downloads the contents of your photo device to a folder of your choosing; options are available to delete the images from the device after downloading, add custom icons to the image files, and add each image’s metadata to its file’s Spotlight comments. This feature worked perfectly in my testing, and each batch of photos is conveniently placed in folder named using the source (for example, USB Card Reader) and the download date. The implementation is also visually appealing: While photos are downloading, a Cameras icon appears in the menu bar and a “progress balloon” appears below it, displaying the status of the download as well as a tiny preview of each image as it’s downloaded. If a particular image piques your interest, a Reveal In Finder button does just that. My only beef here is that I wish Cameras would automatically unmount the device after the download finishes. You manage your choices for various devices in a new Cameras pane of System Preferences, which shows all devices you’ve configured along with each device’s settings. If you change your mind about, say, what you want to happen when you connect your DSLR, you just click on the device’s setting under When Connected to change it. You can also set a default action for all new devices. Note that once you install Cameras, you should leave Image Capture’s preferences alone. Cameras changes Image Capture’s When A Camera Is Connected setting so that Cameras itself is activated—in other words, so that OS X hands devices off to Cameras when they’re connected. Cameras is one of those elegant utilities that makes you wonder, “Why doesn’t Mac OS X work this way?” (Rumors are it will, come Snow Leopard.) For photo enthusiasts and pros, Cameras was well worth its original $10 price tag; the developers have since made the program free, so there’s no excuse not to go get it.